64 years, passed away on January 29, 2019 surrounded by the love of his family. Beloved husband for over 38 years to Rose (nee Najem). Loving son of the late Boula Gebrael (2007) (survived by his wife Marion). Cherished father of Paul (Erin), Jack (Teresa), Nicole Fantetti (Frank) and Anthony (Sarah). Much loved Jidu of Marcello, Roberto, Zoey, Quinn, Joseph and one on the way. Dear brother of Warda Youssef (Charbel), Louis (Amal), Lorette Gebrael-Succur (Tony), Sarkis (Sharon), Rosette Jraige (Bill), Bakhous, Elaine Stravato (Peter). Sadly missed by many nieces, nephews, family, and friends. Youssef was retired after 30 years of service from Ford Motor Company. He loved his garden but more than that, providing for his family was everything. He would do anything to see them thrive and be happy. If you so desire, donations to the Ontario Heart & Stroke Foundation or Canadian Diabetes Association would be appreciated by the family. Visiting Thursday January 31, 2019 from 3-5 & 7-9 pm with parish prayers at 8 pm. 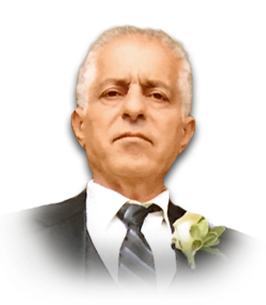 Funeral service on Friday February 1, 2019 at 10:15 am from Families First 3260 Dougall Ave. South Windsor, 519-969-5841 to St. Peter’s Maronite Church, 166 Tecumseh Rd. W. for mass at 11 am. Interment Heavenly Rest Cemetery. Funeral service to leave Families First Funeral Home at 10:15 am to arrive at church in time for mass at 11 am.